Over 100,000 tile & countertop options... and we'll help you find the perfect one. Call us at 253-872-0449 or email info@tilelines.com to set up a complimentary design appointment. We'll help you find the perfect products for your project. For ten years we've provided the greater King County area (and beyond, with customers from Montana to Alaska) with friendly service, expert advice for tile installation and design, and over 100,000 tile & countertop options. What's more, we'll help you navigate these options to find the perfect products for your project. Our specialty is helping homeowners pick the right products, whether you're hiring a contractor or installing the tile yourself. Visit our showroom for full-sized mock-ups of tile installations to get hands-on information. Ask us anything! Our team of design and installation experts will help you choose everything you need! 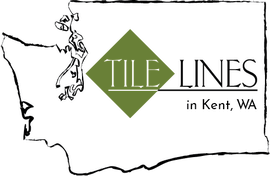 Call 253-872-0449 or email info@tilelines.com to schedule an appointment today! We have over 7000 square feet of tile in stock for you to take home same day. If you need tile in a hurry, we have options! Visit our customer reviews page for more testimonials.